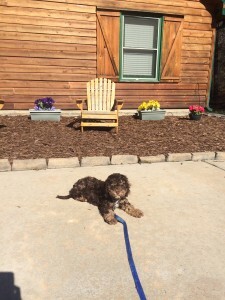 Joe the Cockapoo practicing down-stays while board training with CPT Trainer Megan Sinteff Jefferson. The down-stay exercise is important for keeping a dog safe outdoors and under control indoors. 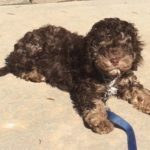 Therefore, upon graduation from board training we expect Joe to be a safe, controlled Cockapoo! Board training is excellent for persons who work long hours, travel frequently for work, have extensive social or familial commitments, or who lack the confidence or desire to participate in the more difficult and time consuming early stages of training. Board training is also great for clients who simply wish to advance their dog’s training while they are away on vacation. Let CPT perform the training so that you can relax and enjoy your dog once he/she returns home! Outdoors and from a distance. Great work Megan! And in addition to training Joe has plenty of fun romping about Megan’s multi-acre property both with Megan and with fellow boarding and board train dogs.